We call them “Janta Janardhan” in India. In hindi, “Janardhan” is another name of “God Vishnu”. When “Janta”, which means “Public” is associated with “Janardhan”, it is associating the public with good behavior and considering the public similar to God. The “Public” is the common man. And common man is very powerful. They can fall empires when they arise. This was another such arising of the common man but for a strange cause. If it was for the right or, the wrong is for you to decide. We call it culture. In fact we put a lot of things onto culture, more so if it is something that is not the right thing to do. Because it is easier to hide behind culture. Nobody dare touch you then. Jallikattu is a sport played in parts of Tamil Nadu during the Pongal season. It is a form of bull taming where bulls are first aroused by keeping them in confinement and then set free into the crowd. A group of volunteers then try to tame the bull. While the original sport did not allow for torturing bulls, the sport has changed over the last few years. Bulls are tortured to make them even more wilder so that the sport becomes even more challenging. To cut the story short, the Supreme court of India banned the sport after finding that an order passed by it about 6 years back asking for a control on cruelty to the animals was blatantly violated. They were right on their part. Warnings had not worked so Ban was the solution. An organization that support animal rights was the one that had raised this case. The Ban Order was too much for people of Tamil Nadu to take and then it happened. The “Janta Janardhan” woke up and took to the Marina beach in Chennai protesting against the ban and demanding that the ban be lifted. Youngsters were the leaders to this unique protest. Celebrities joined them and then it was unstoppable. More than 3 days of protest. And then there were ordinances being passed by the state government, unrest in political circles, people flying in and out of the state, political meetings, debates on national TV news and what not. The sport was allowed through a temporary ordinance from the state but that was not enough. People wanted a permanent solution and then the peaceful protests turned violent. The “Janta Janardhan” turned into a “mob” – far more powerful and dangerous. As strange as it sounds, all this for a Sport that we are associating with Culture? I haven’t heard of another time when we associated a sport with Culture and fought for it. When did this sport come into existence? Was it there since the culture existed? I am not against the sport. I am not even against the cruelty that you unleash on the bulls, for I don’t have the right to do that because I am a non-vegetarian. But, torturing an animal pinches somewhere deep inside. A slow death is much more painful than instant death. And even more painful was to hear some of the justifications from a bunch of limelight jokers on the National TV. Some are quick to associate it with other instances of domestication like “milking a cow”. It was an intellectual professor in a Malayalam news channel, who claimed that milking a cow was also a form of torture. Phew! A few others claim that the sport is played to protect the animals. The money that is made from the sport is used to take care of the animals and that these animals are like their kids. “Have you tried inserting chilli powder into your kids’ nostrils”?, was a question I desperately wanted to ask. And then came the climax. The sport was played in some parts of the state while a few others still continue to protest for a permanent solution. Two people were trampled to death and dozens wounded in southern India during the controversial bull-taming sport that resumed Sunday after tens of thousands of demonstrators mounted unprecedented pressure this week on the government to overturn a ban. 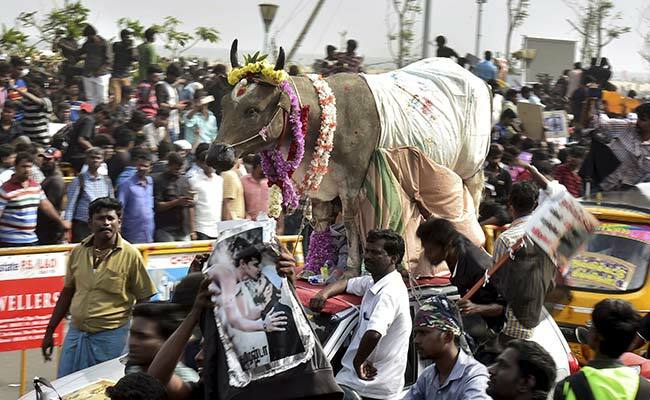 At least seven persons were injured in a jallikattu event held at Kumulur in Tiruchi district on Monday. One of them is said to be critical. More than 30 bulls brought from different parts of Tiruchirapalli, Ariyalur and Thanjavur districts were released in the event today. It attracted more than 2,000 spectators from various villages. Just a few days back, I saw a lot of political parties wanting the government to answer for the deaths of about 90 people who they claimed died because of the demonetization. They claim that these people died because they had to stand in queues to withdraw money from the ATMs. Will anybody be held responsible for these deaths at Jallikattu or, will that be blamed onto our Culture? Should the Supreme Court be wasting time on such cases when there are thousands of other civil and criminal cases pending? Is it right to hide behind culture? When we, the youngsters of the country demand amending rules and beliefs that we know are not right but are being passed on from generations as part of Culture, is it right to support a sport like Jallikattu because it is part of our culture (or, so we believe)? What is the definition of logic? Once again, I am not against the sport. Go ahead and practice it but don’t blame it on Culture. Be bold to agree that it is a SPORT and that we love the adventure of it irrespective of an animal being tortured or, people being killed. I am still searching for the LOGIC behind the protest at Marina Beach and the huge loss of one of the most precious things we as human being have – TIME. Our New Definition of Heroes – Are We Misunderstanding Freedom of Speech?